DUMONT -- Matt La Porte's bearing was obvious from a young age. He would address elders as ma’am and sir, said Marie Grieco, who has lived next door to La Porte's family in Dumont for more than 20 years. But that was Matt's way, those who knew him said. Although La Porte, 20, spent much of his childhood away at school, the news that he was among those confirmed dead in yesterday's massacre at Virginia Tech has shaken the community. "You think in a small town like this that nothing happens. And you expect to go away to college and have a wonderful experience,” said Lauren Beach, 21, who lives across Medford Street from the La Porte family. During summers home from boarding school, La Porte biked to a lifeguarding job at the Cresskill Municipal Pool. In the fall, on his way back to school, he could be seen leaving home in a crisp blue uniform and military cap. La Porte was one of two recent graduates from Carson Long Military Institute in Pennsylvania, enrolled at Virginia Tech, where he was a sophomore. The other student, a freshman, lived in the same dormitory where the initial attack took place yesterday morning, said Lt. Colonel David Comolli. A flag in the middle of the boarding school's campus flies at half-staff today. “Matthew was an exemplary student at Carson Long whose love of music and fellow cadets were an inspiration to all on campus,” the school said in a statement. "We'll likely have a memorial service in the chapel on Friday," said Colonel Carson Holman, spokesman for the New Bloomfield, Pa., school. Holman described La Porte as a hard-working and active student who graduated third in the Class of 2005. He served for four years on the drum and bugle corps and was a member of the color guard, glee club and baseball and soccer teams. Yet at the same time, he made honor society five of his six years there. He graduated as a member of the National Honor Society and, because of his achievements, earned the Emerging Leader Scholarship from the Virginia Tech Corps of Cadets. "He was really, truly a good and pleasant boy. It's an absolute tragic thing for all of us," Holman said. "A lot of our faculty members knew him and worked with him, and we all feel very sad. There are a number of students here that seem to be hit pretty hard." On his MySpace page, La Porte described himself as a music and military buff. He attended Carson Long from 1999 to 2005. He listed his favorite movies as "Braveheart" and "The Matrix," but he was also a fan of literary classics -- among them, "The Great Gatsby", "1984" and "Brave New World." The La Portes – including parents Joe and Barbara and sister, Priscilla, a senior at Paramus Catholic High School – have regularly attended church together at nearby Sacred Heart in Haworth, neighbors said. The family had discussed relocating to Virginia someday, Grieco said. Earlier today, Dumont Police Chief Brian Venezio read a statement from the family. “Heartfelt thanks to all the friends, family and community people that have shown their support in this tragic time,” the family said. Venezio said the family learned about the death sometime last night from a commander at the Virginia Tech Corps of Cadets. Later last night, Virginia State Police notified borough police, who then called the family once more. As a youngster, La Porte participated in Little League and Boy Scouts in Dumont. 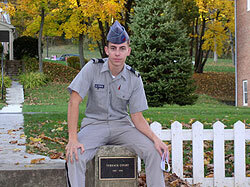 He had aspirations to become an Air Force officer someday, Venezio said. In his 2005 senior oration, La Porte gave heartfelt thanks to the school staff and his family.